But even if it isn’t what we will see this year, still, hopeful for something similar in the future? Moving on, time to flip things to the home uni’s. We’ll do the same as before, starting with the Walden era (and even slightly before) and move it right through to today. The poll is up to the right, plus comments are always appreciated. There isn’t a lot out there in full-blown color from this era in terms of home uni’s. 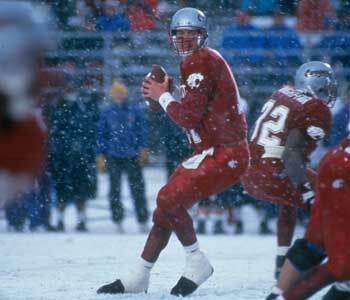 Here’s a black-n-white shot from the ’88 Apple Cup that shows the biggest change, which has the same gray pants seen here in the road version. Same jersey as the Erickson change, basically, but this time we came out with the crimson pants to match. 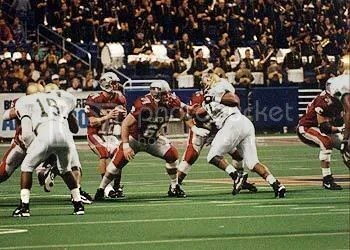 There were some variations, including the 1994 Alamo Bowl, which saw these pants worn as a one-time only deal. 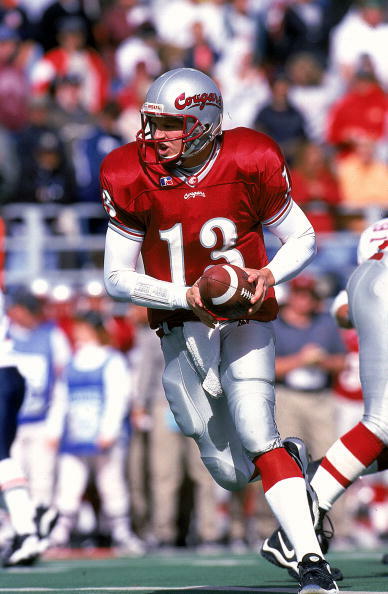 There were some other looks in the late 90’s, including a change in the numerals but kept with the crimson pants. And then these uni’s from 1999, which saw yet another change to the numerals, the WSU sometimes on the helmet and sometimes the Cougars script, and even gray pants at home. A new look for the new millennium. The program went the direction of the Denver Broncos style ushered in the late 90’s, which the vertical stripes. An extra layer of dimension to the numerals as well. Generally a busy look. Later we would add on to this uni with an extra stripe on the shoulders, and continue the main vertical stripe all the way up to the neck line. First seen here at the 2003 Rose Bowl. We would continue this double-shoulder stripe look for the next couple of seasons. Then, we would clean it all up in 2005, which brings us to today. 5) The Current Versions – Mkristo Bruce – Jerome Harrison – Jason Hill – Alex Brink years. A pretty clean look, mixing past and present. Gray pants with a crimson-white-crimson stripe, no hip logo. WSU logo on the helmet, and block white numerals and lettering. Small “Washington State” across the chest. Black shoes. A clean, sharp look all the way around. Of course, we have had a few different looks mixed in. 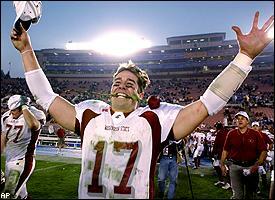 Once we rolled out a whole new deal with Russell for a USC home game in 2006, fresh for the TBS national TV coverage. This look featured crimson helmets and a completely new lettering, design, the whole thing. Gone was the “Washington State” lettering, replaced by just Cougars in a totally different, white font. Crimson as the main color but gray featured prominently along the shoulders and down to the sleeve, with crimson numbers on the sleeve. Gray pants accented by some small crimson stripes around the keee. Black shoes, and, for the first time in a while, crimson helmets at home. A look we haven’t seen again, by the way. I always was interested in what people thought of this alternate version. I did remember hearing very mixed opinions, some from it’s FREAKIN‘ SWEET and others who just hated it. When I first saw them I was like “WTF?” but then as the game went on I got used to them, to the point that I think I actually liked them. Maybe we’ll see them again, someday? 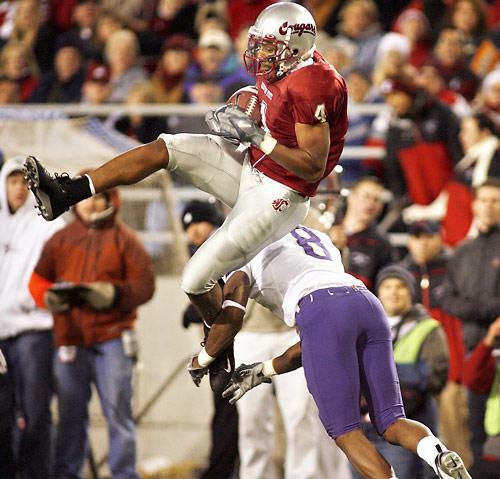 And finally, for Apple Cup home games, we went with the Cougars script helmets as well as the “throwback” solid gray pants. 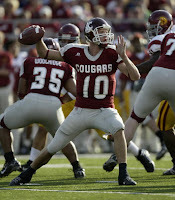 For home games, the Cougars will wear silver helmets with the script Cougar lettering. The jerseys are crimson, and the pants are silver with a three inch stripes down the side rotating crimson, white, crimson. 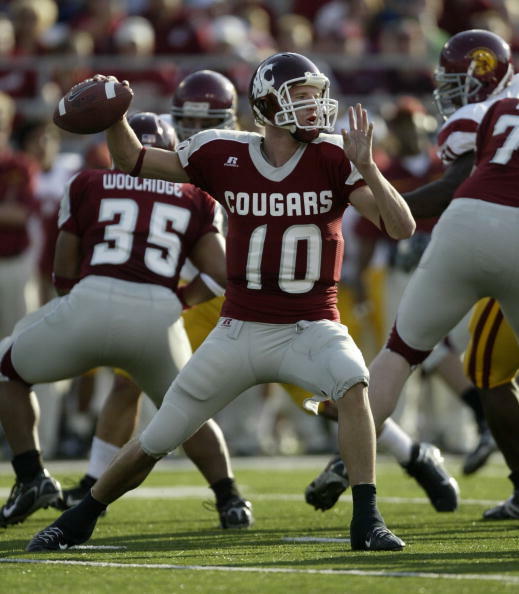 For away games, the Cougars will wear crimson helmets with the white Cougar head logo. The jerseys are white, and the pants are crimson with a three inch stripe rotating crimson, white, crimson. Hmm, something different for the Seattle game? We’ll have to work our back channels to see if we can get a tip on what to expect in what, now less than TWO WEEKS until kickoff?? Unbelievable. So there you have it. Vote early/often, post your thoughts on what you like and what you don’t. Let’s hear it. Enjoy your Sunday, and most of all, GO COUGS! With practice sessions about to begin, we will step outside the box a bit today. All the buzz has been about the new uniforms that will grace our Cougars next year once the Nike deal takes hold in January, and obviously some concerns arose with the news. Would they create something hideous as we’ve seen from our NW brethren in Oregon? Or the “Jog-Bra” look at Oregon State? Maybe they’ll stay conservative, ala UW which aside from changing some of the font on the numbers, well, they still “look” like UW, you know what I mean? Crimson pants with white stripes down the side. Solid block crimson numerals with double-crimson stripe on the sleeves. Gray helmets with Cougars script, and a center stripe on the helmet. White face masks, white shoes. Mainly rolled with this style in the Walden era with very little change. Basic, but clean. Here we see the change that Erickson wanted when he showed up. Gray pants without any piping or stripes, and a WSU cougar head logo on the hip. 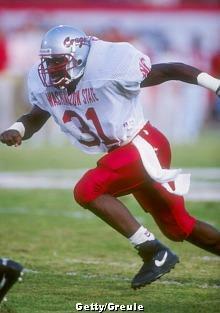 White jerseys with basic lettering, and the big change having the Washington State school name across the chest. 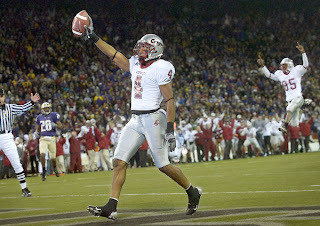 WSU Cougar head logo on the sleeves. White shoes. Gray helmets with Cougars script and crimson face masks. 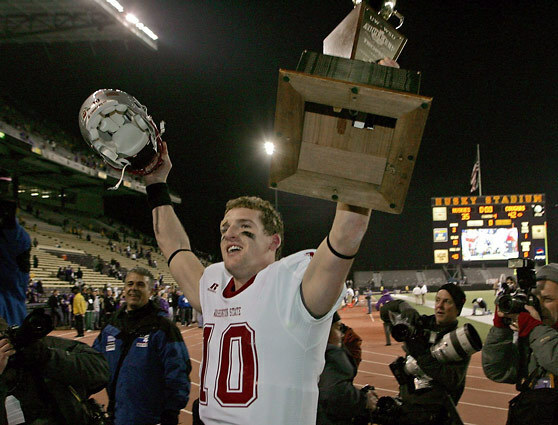 Erickson was quoted at the time he took the WSU job that if we were going to play in the Pac-10, we were going to look like we belonged in the Pac-10, so some tweaks were made. I like this look to an extent, but I could do without the Washington State name across the chest. Same jersey as we had when Erickson did the tweaking. Cougar head logo on the sleeves, school name across the chest, basic crimson lettering. But the big change? solid colors that many schools went with in the 90’s for their road pants. Still a solid look, and a nice contrast of colors with the crimson pants and gray helmets. Although some would complain on the overall color of the crimson, as they just didn’t look deep enough. In the lighting conditions on the road or on TV, a lot of times we looked too “fire engine red”, and it’s hard to argue with that when you view some of the pics. Later you’ll see we attempted to correct that, but as you can see here, it is more of a red vs. a crimson. There were a few variations in this era. Occasionally we would roll out the gray pants on the road, but it was very rare. The “Bledsoe’s” wore that look for a road game at Oregon in 1991, and Leaf and company wore it at Stanford in the mid-90’s and maybe the biggest win ever, the 1997 Apple Cup. But it was pretty rare. The 1997 Rose Bowl saw the gray script helmets with the rose as part of the script (just beautiful! ), with white tops and crimson pants. 4) The Gesser – Kegel – Derting years – stripes and stuff. A big departure from the past, WSU joined many others in going with the Russell Athletics look of the side, “modern” stripes which went down the side of the torso up through the top, under the shoulders and finishing at the neck. The school name still appeared across the chest, but it was considerably smaller, and a small WSU logo was at the center of the neck line. 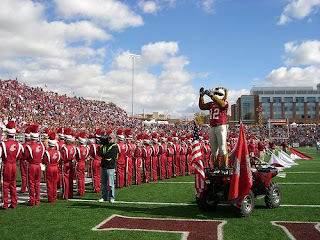 WSU also became one of the only schools in America with more than one helmet, rolling out the crimson shells for road games, with white face masks. White shoes and white pants with crimson stripes down the side to complete the vertical look. The numbers got some block in gray coloring to give them an extra dimension. We even modified things a bit to these jerseys, going with an extra stripe along the shoulders for a different look. I liked these uni’s initially, but ultimately I longed for the more conservative, old-school look without the busy stripes on the jerseys. Which takes us to today. 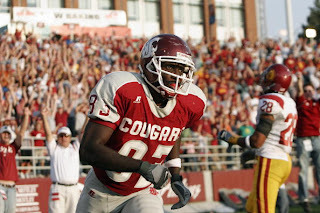 Crimson helmets with Cougar head logo and white face masks, and the school name remains small across the chest. Black shoes complete the look, and it’s sharp. The stripes on the jerseys and wavy stripes to the pants are gone, and the lettering is much more of a block-style with an extra crimson outline. Finally, the look that we have seen in the last two Apple Cups. 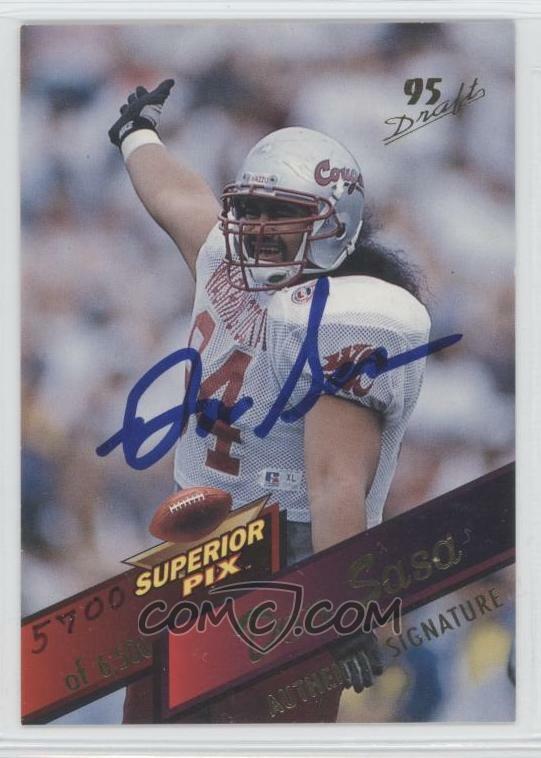 It’s also a look that has done us well over the years (1988 Aloha Bowl, 1997 Apple Cup, 2005 and 2007 Apple Cups). 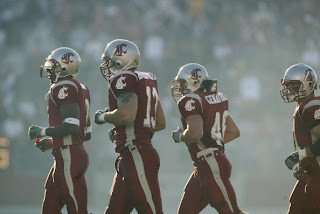 Yes, I’m talking about the gray helmets with the Cougars script, same simple, clean jerseys, solid gray pants with the WSU hip logo, and black shoes. I have to admit…..I FREAKIN’ LOVE IT! So there you have it. Feel free to chime in via comments or vote in the poll for your favorite combo. You are currently browsing the archives for the WSU Uni Watch category.